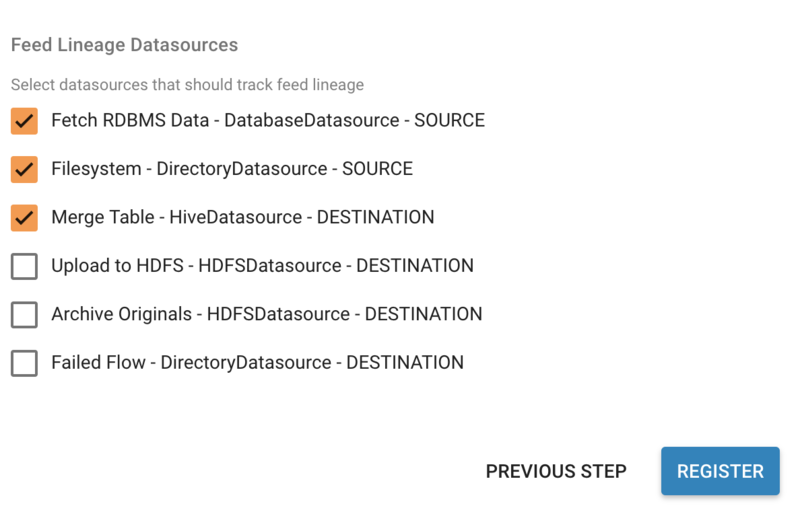 Feeds track and display dependencies to other feeds and also their connections through their datasources. The Lineage view on the Feed Details page is an interactive canvas that allows the user to analyze and inspect the feeds relationships. The Designer must indicate NiFi processors that represent a source or sink to be tracked. The following guide describes how lineage is tracked and the role of designers. When a feed depends upon another feed(s) via a precondition (a TriggerFeed), then it will be assigned as “depends on” relationship in the Feed Lineage graph. Feeds are also connected through their datasources. If FeedA writes to a table and FeedB uses that same table as its source than it will be connected. In order to get your feed to see its lineage you will need to do 2 things. Assign the datasources to the template. See the section Registering Datasources with a Template below. Save the Feed. Once the template has been registered you will need to save the feed. Go to the feed details. Click the Pencil icon on any section. Click Save. NiFi processors and their properties are defined as datasources in the system. These definitions are stored in the Kylo metadata repository and they can be registered 2 ways. Kylo read the file datasource-definitions.json found in the classpath on startup and will update the datasource definitions. This will be in the /opt/kylo/kylo-services/conf directory. Kylo ships with many of the NiFi processors defined, but you may find you want to alter or add new ones. If you need to update or add new datasource definitions there is a REST endpoint that allows you to post the new definition data. "identityString":"<optional> <supports expressions> A string identifying uniqueness. "title":"<optional> <supports expressions> A Title that will be displayed on the Feed Lineage page. If not supplied it will use the 'identityString' property"
"description":" Directory or File source"
Refer to the datasource-definitions.json file for more details. Templates need to be configured to identify the datasources that it should track. When registering a template that last step will show the available datasources it found in your flow. Kylo reads the template and then matches each processor with the datasource definition (see above). You will then need to select the datasources you wish to track. This step is necessary because you may have a variety of processors in the flow that match a processor type in the datasource definition (i.e. PutFile for failed flows), but those don’t define the true destination of the flow. If needed you can adjust the styles of the feeds and each type of datasource. Kylo reads styles on startup from the /opt/kylo/kylo-services/conf/datasource-styles.json This file can be found in /opt/kylo/kylo-services/conf. Styles are not stored in the metadata. They are read from this file on startup. You can alter styles using the REST endpoint below, but to persist it for the next time you will want to update this JSON file.